Crew figures add “life” to an otherwise static model and are needed to make convincing dioramas. Surprisingly realistic crew figures can be made from card and this free downloadable model allows you to make your own. 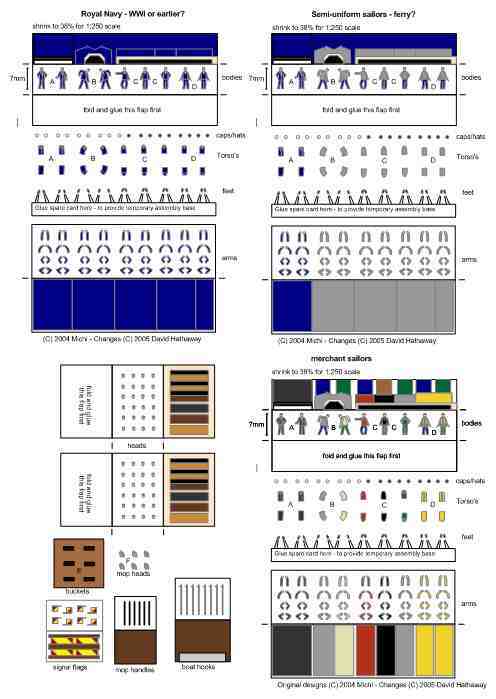 8 basic figures are provided in each set – each crewman in a different basic “pose”. A number of spare arms and heads are provided to allow many different poses to be modeled. – Glue extra “torso” layers to the front and back. – Add different arms , heads and hats as necessary. – A number of other accessories are added – mops, buckets, semaphore flags, etc – use as you see fit. Note there is a laser-cut version of these figures available for purchase from Pleiner-Models – the link to their web-site is give on the “links” page.